Apple today announced that it has lowered the price of its iTunes Plus tracks to 99 cents, effectively killing the idea that DRM-free tracks are worth paying a premium for. Other online vendors, including Amazon and Wal-Mart, already offer DRM-free tracks at 99 cents or less. Apple introduced the iTunes Plus option just six months ago. All iTunes Plus tracks feature DRM-free music with 256 kbps AAC encoding for audio quality. The iTunes Plus catalog is now the largest DRM-free catalog in the world. 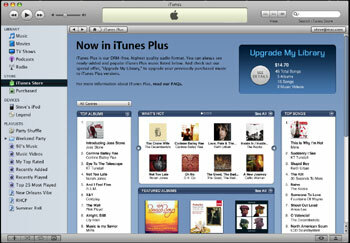 But while iTunes Plus removed restrictions on many tracks, it also introduced new complexity to the iTunes store and a premium price tag. Apple has gone from zero to two million DRM-free tracks in half a year; if this trend continues, DRM’s tracks will be phased out within a year. Customers can now download tracks from a variety of labels without limitations on the type of music player or number of computers that purchased songs can be played on. iTunes Plus songs purchased from the iTunes Store will play on all iPods, iPhone, Windows or Mac computers, widescreen TVs with Apple TV, as well as many other digital music players. No, that is not what they did, they effectively killed the idea that DRM-Free tracks are worth paying $1.29 for them …. it’s a price point issue.